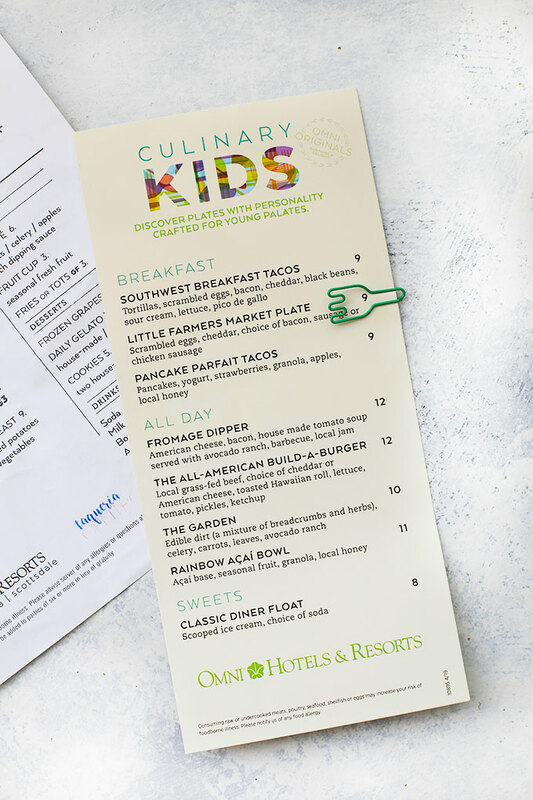 We got a chance to try the new Culinary Kids menu at Omni Hotels & Resorts. 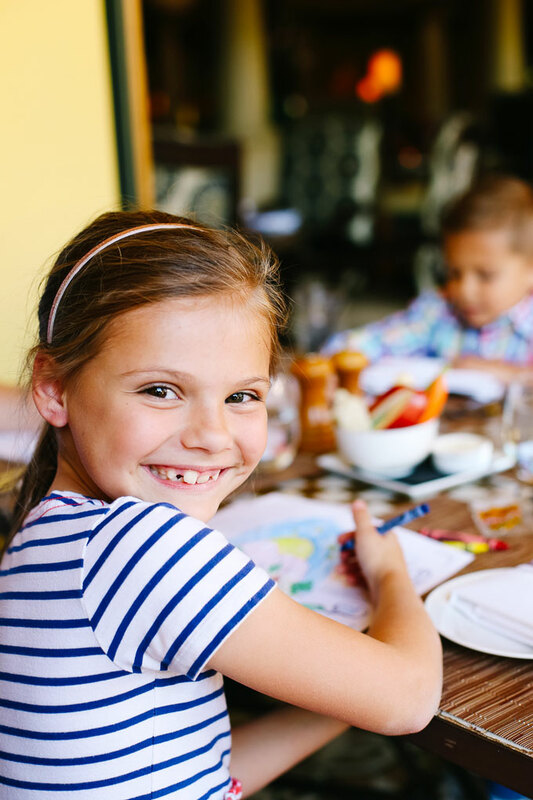 It’s a fantastic dining experience for the little foodies and adventurers in your life! This is a sponsored conversation written by me on behalf of Omni Hotels & Resorts. The opinions and text are all mine. Since our kids were big enough to really “get” birthdays, we’ve started a fun tradition in lieu of birthday parties. Instead, we do birthday adventures. Basically, the “adventure” can be anything the birthday boy or girl chooses. 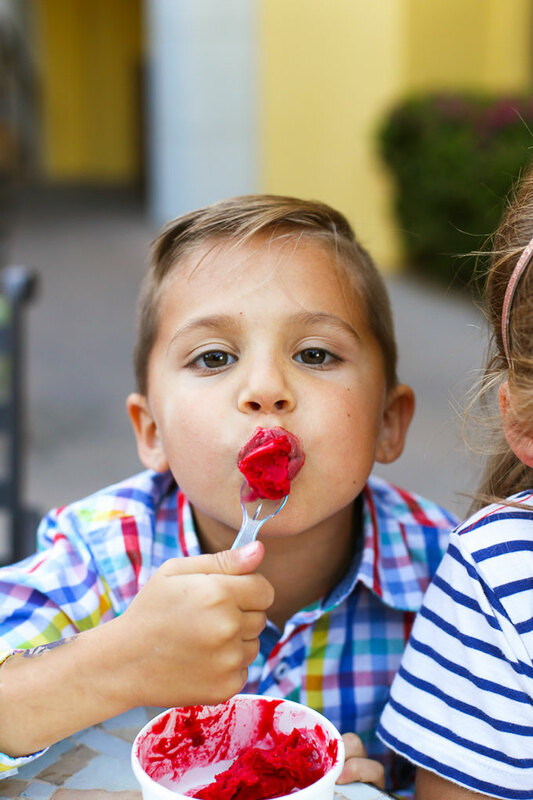 We’ve done fondue dinners, bounced an hour or two at a kids indoor inflatable “park,” gone to museums, aquariums, and the movies, visited a farmer’s market to choose a few new treats (like gourmet cotton candy), done at home “campouts” and more. It’s been SUCH a fun way to celebrate with our little family. 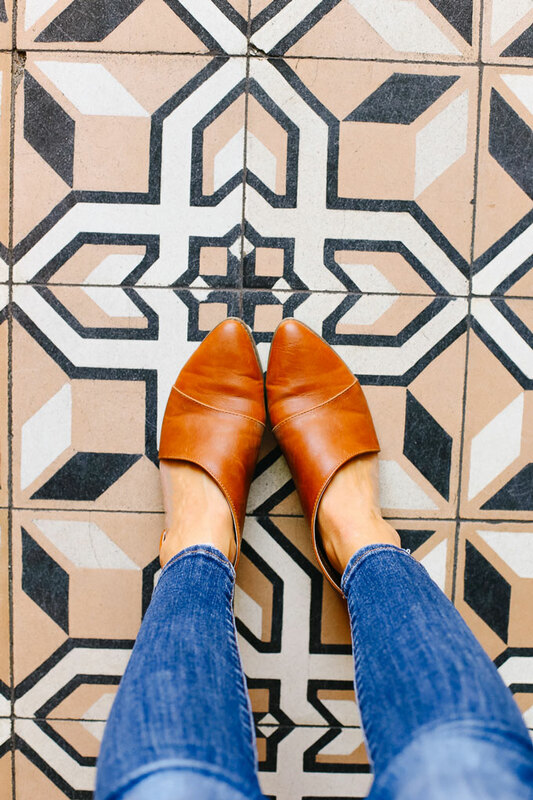 We connect and enjoy spending time together doing something a little out of the ordinary. This year, Michael’s birthday fell on a Friday, and we decided to take the day off for a day long date with just the two of us, then to do something fun with the kids after they got out of school. 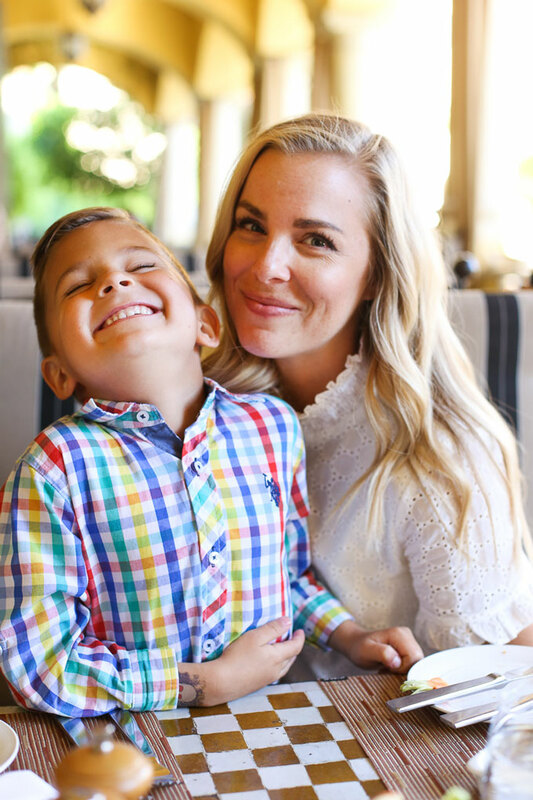 Our birthday adventure coincided with a fun invitation from Omni Hotels & Resorts to come try out their new Culinary Kids menu. 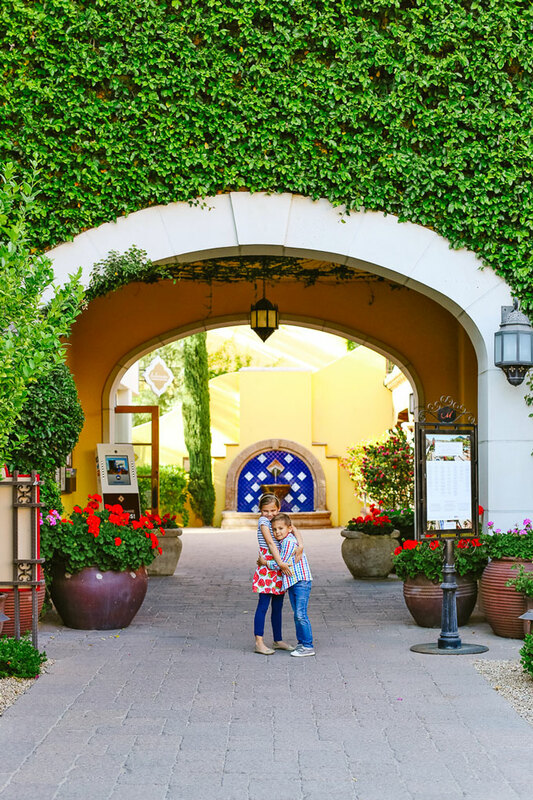 We were invited to come and stay at our local Omni Hotel, the Omni Scottsdale Resort & Spa at Montelucia, nestled near Camelback mountain in a cozy section of Scottsdale, Arizona. 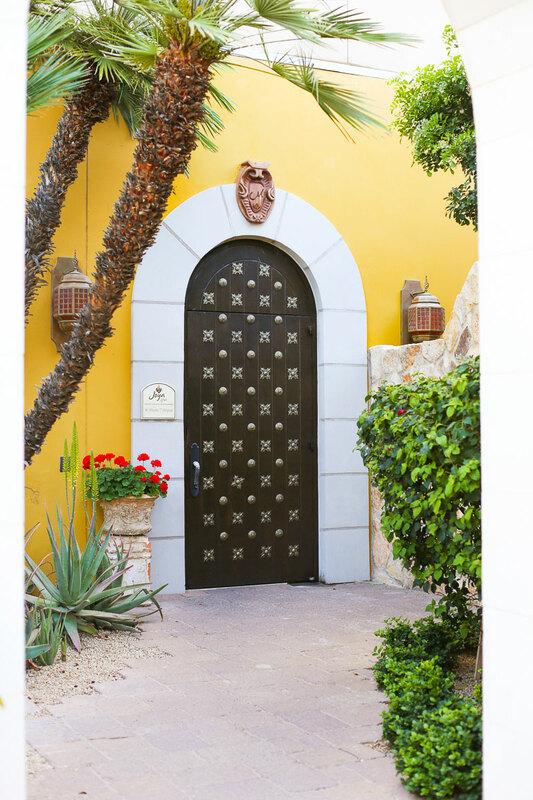 The gorgeous desert mountain backdrop is the perfect setting for this Spain-inspired hotel, and we couldn’t WAIT to try their fantastic restaurants. 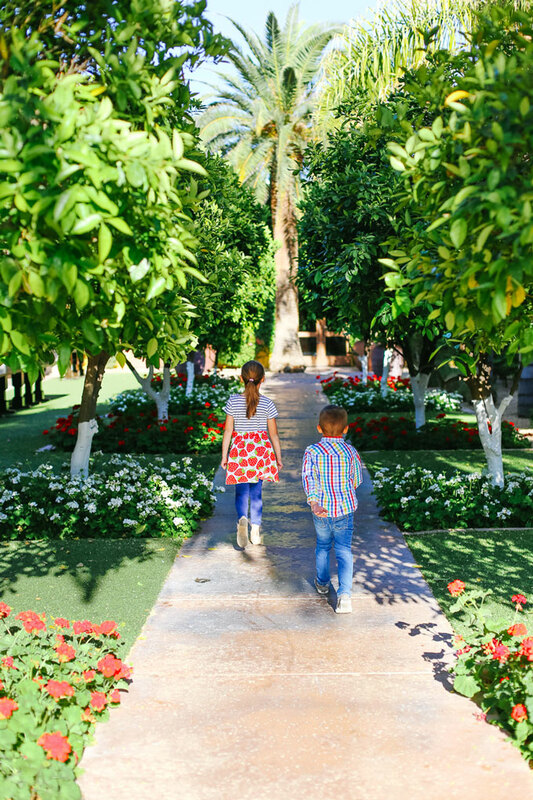 We had a bit of time before dinner to wander the hotel and grounds, and every corner seemed to have something new to offer, from fountains and water features, to gorgeous florals and greenery, to hidden doors, fireplaces, and seating areas. 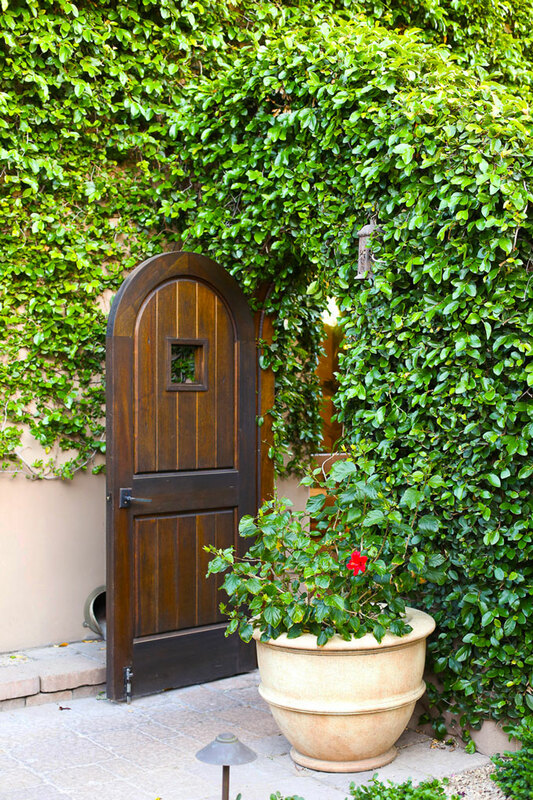 The hotel is designed with Spanish-inspired feel. 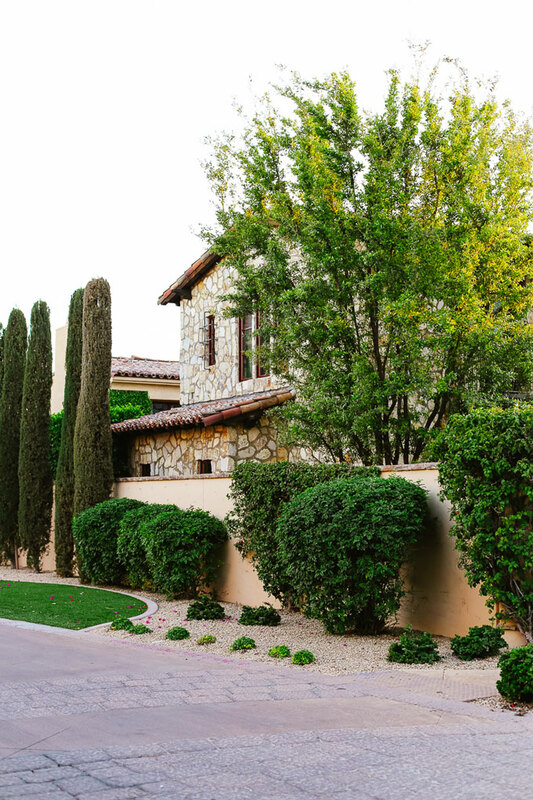 The architecture, landscape, and even the small details in the rooms all have a Spanish villa feel that makes you forget you’re in Arizona! Every element of the indoor and outdoor architecture was stunning–it was a REAL challenge not to post 100 pictures in this post! There are 3 pools on site, along with a luxury spa and salon, boutiques, bocce ball and lawn games, live music, hammocks, and plenty of guided activities (like group fitness classes and guided hikes). 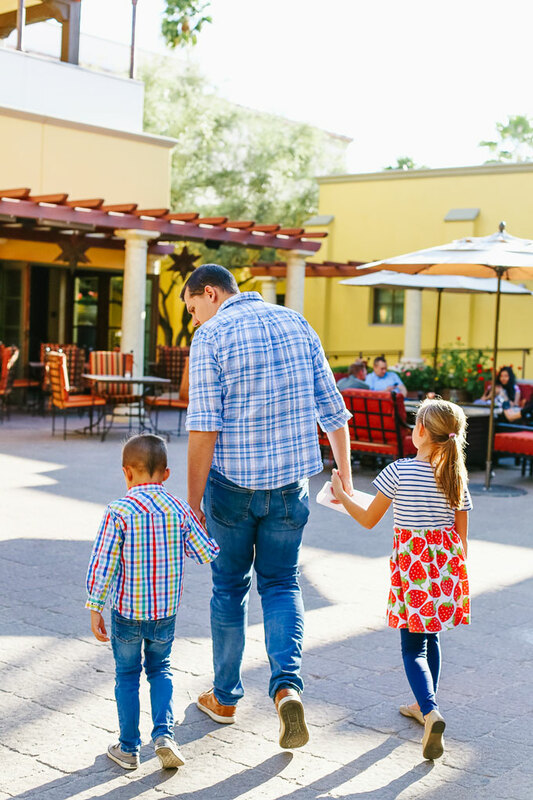 If that wasn’t enough, they’re also located near lots of shopping, golf courses, and restaurants in Scottsdale to explore during your stay. 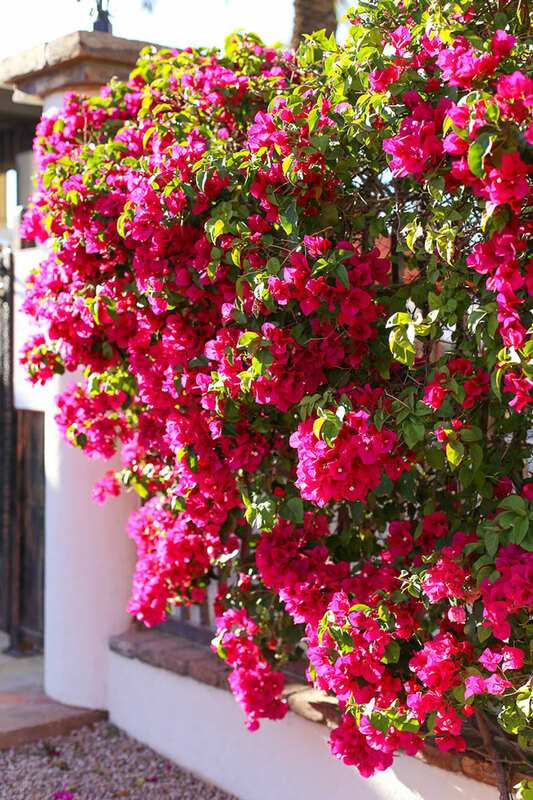 See more of what the hotel has to offer here. 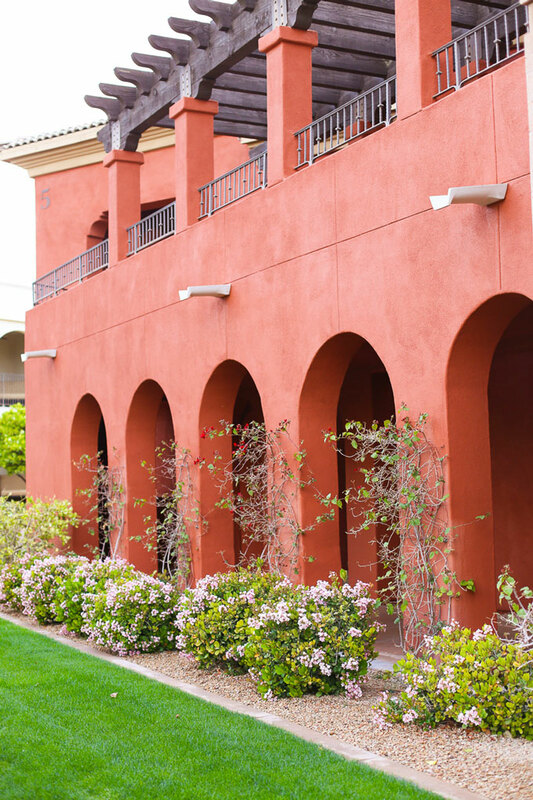 The Omni Scottsdale Resort at Montelucia has two primary restaurants, Taqueria Centro and Prado. We opted for Prado, which felt perfect for celebrating Michael’s birthday. 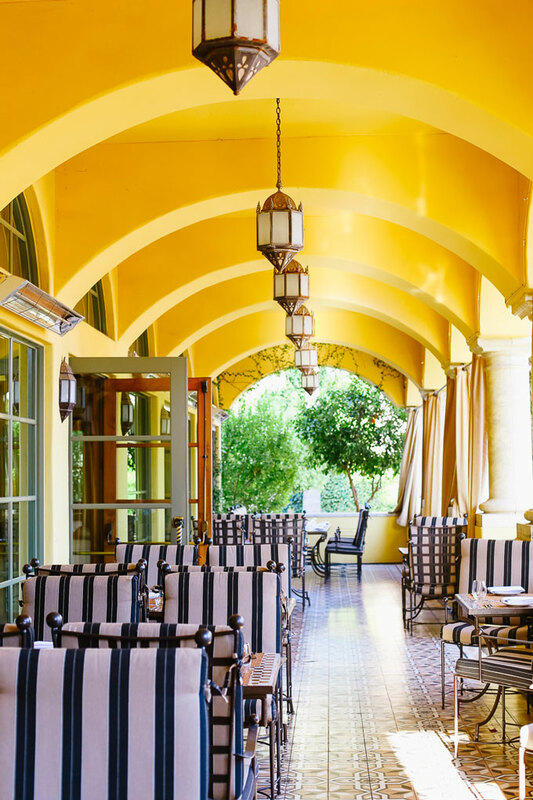 PRADO – Prado is the hotel’s premier restaurant and has an elegant, classic fine dining feel while still being exceedingly family friendly. 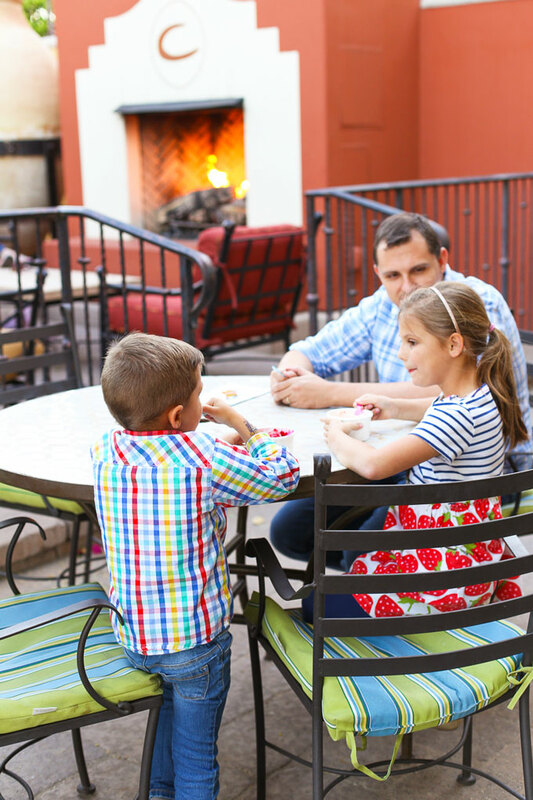 We chose patio seating overlooking Camelback Mountain with a view of the wood-fired Tapas display kitchen. Our hosts got plastic glasses for the kids to use, and brought each of them a coloring page with crayons. Everyone also spoke to the kids like they were humans instead of bypassing them to talk to the grown-ups, which I really appreciate. GLUTEN FREE FRIENDLY! I was SO impressed by how knowledgable and courteous every staff member was about navigating food allergies. Our server knew off-hand every menu item that was naturally gluten free and told us that nearly any menu item could be made to accommodate gluten intolerance. Some restaurants aren’t well-equipped to handle these sorts of requests, and it was such a relief and pleasure to eat somewhere where we were welcomed so warmly (gluten intolerance and all). They even went the extra mile to bring us a plate of grilled gluten free bread to munch on while we waited for our food, which almost NEVER happens. 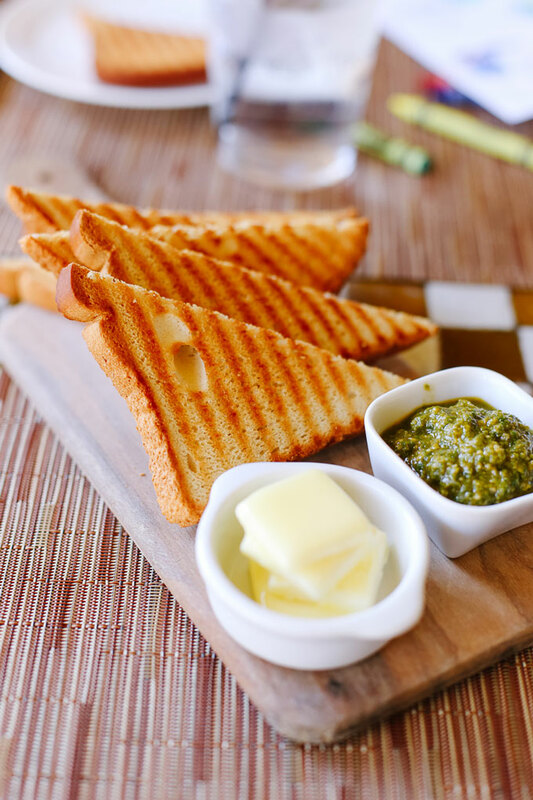 The bread was delicious, and it was served with butter, olive oil, and house-made pesto. 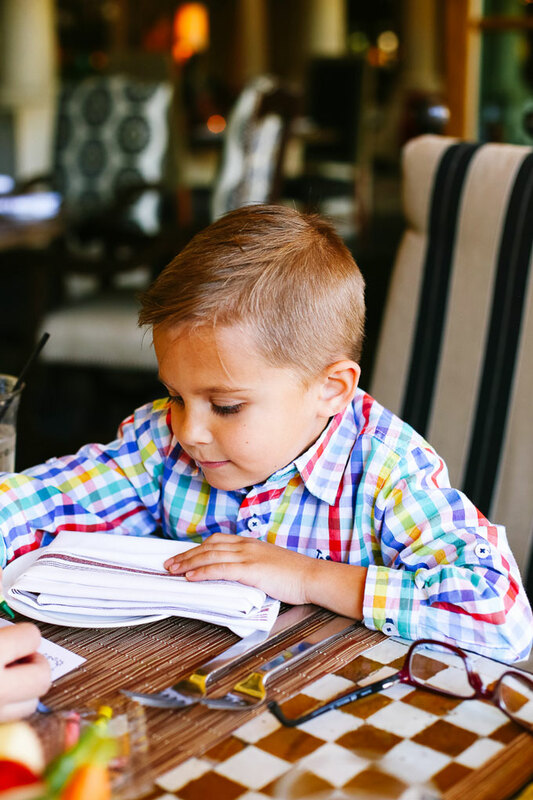 WHAT WE ORDERED – From the kids menu, we ordered gluten free pasta for Sophie, grilled chicken with asparagus and french fries for Milo, and a crudite plate to share. 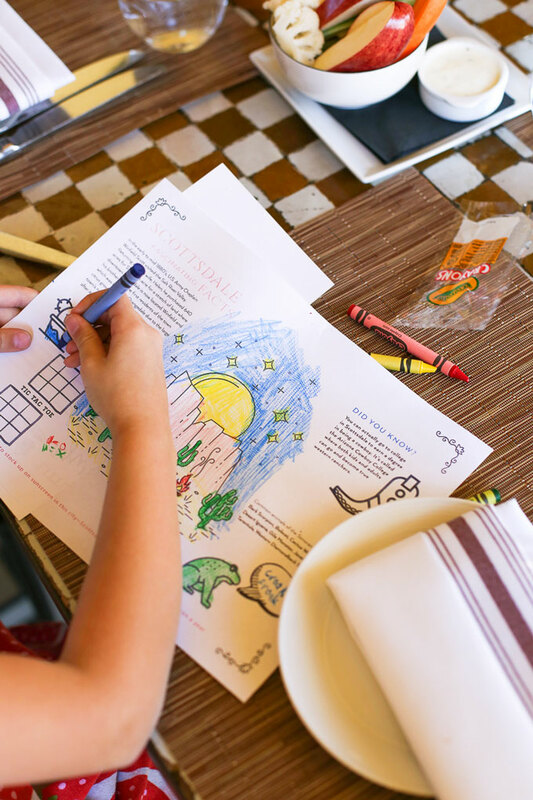 Omni is always innovating new and exciting ways to engage and inspire their guests, and their new Culinary Kids menu is their latest adventure, available widely at their hotels and resorts. They describe it as “…plates with personality crafted for young palates,” and I couldn’t agree more. WHAT I LOVE ABOUT THE CULINARY KIDS MENU. I love that the culinary kids menu doesn’t “dumb down” the menu for kids. 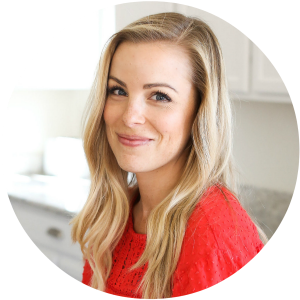 Instead, it builds on some classic kid favorites (like burgers and tacos) and puts fun, creative twists on them. Then, they add some great unexpected choices, like the pancake parfait tacos at breakfast (with yogurt, strawberries, granola, apples, and local honey) or “The Garden,” which comes with veggies and edible “dirt” (toasted, herbed breadcrumbs). OPTIONS FOR EVERY TIME OF DAY. 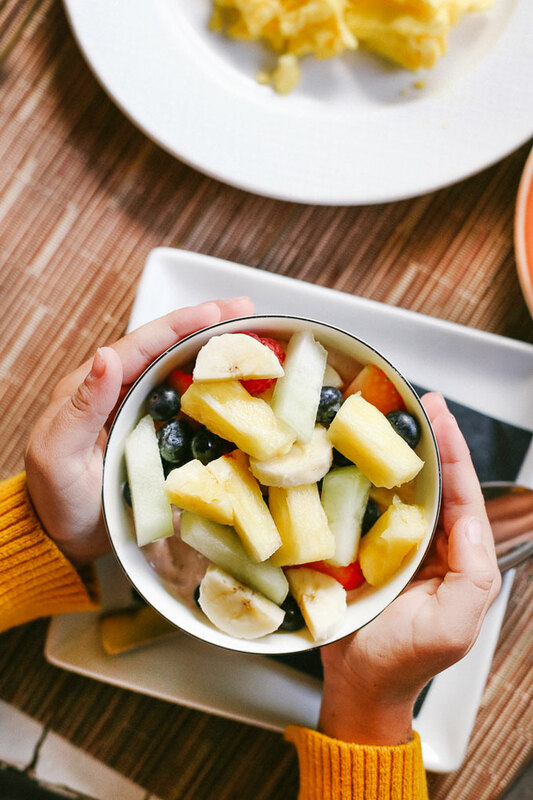 There are Breakfast choices (Southwest breakfast tacos, little farmers market plate, and pancake parfait tacos), All-Day choices (from a garden-inspired dipping plate, to a build-your-own burger, rainbow acai bowl, and more), and even a fun ice cream float option for dessert. WHAT WE ORDERED. We ordered the kids’ breakfasts entirely from the Culinary Kids menu. 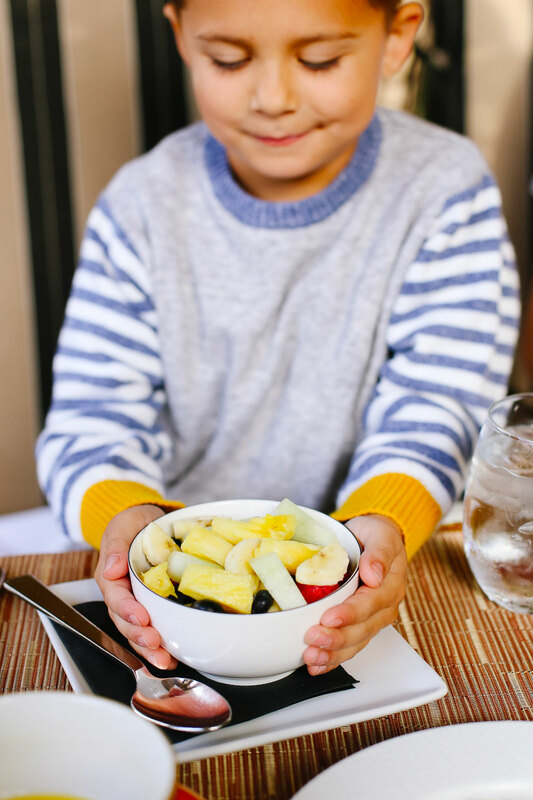 Milo ordered the Rainbow Acai Bowl, which was vibrant and pretty. We loved that it’s topped with plenty of fresh fruit and can come with granola, if you like. Sophie went with the Southwest Breakfast Tacos. 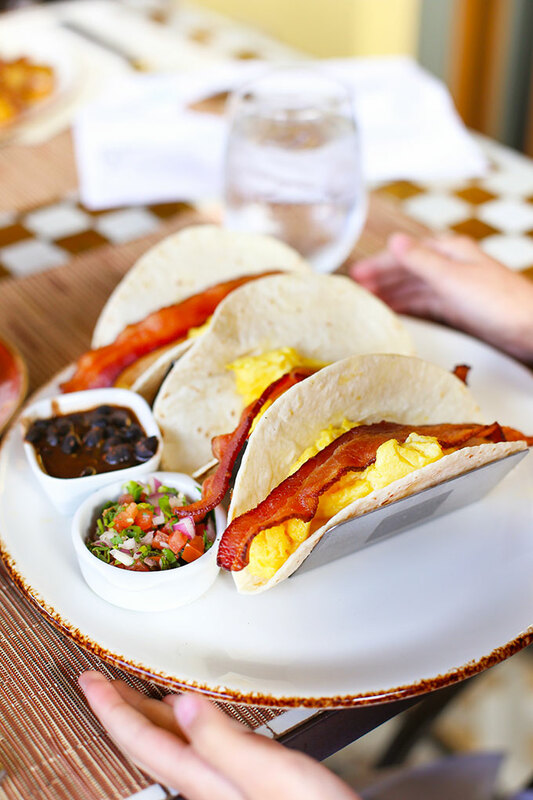 We are big breakfast taco fans over here, so we couldn’t wait to see how Omni’s tasted. They were a BIG hit! 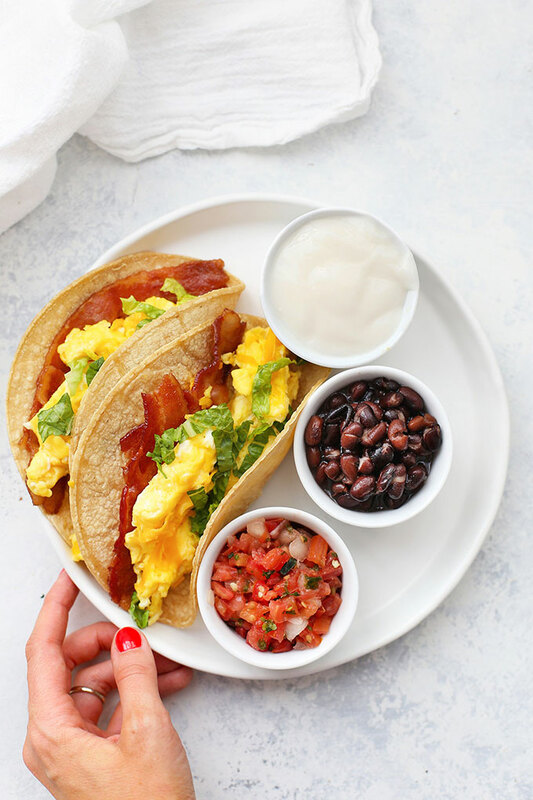 Scrambled eggs, bacon, and then plenty of toppings (like lettuce, sour cream, cheese, black beans, and pico de gallo) are all available. Sophie loved getting to “build” her own by adding black beans and pico de gallo to hers. I tasted the black beans and wished I had a giant bowlful. They were perfectly seasoned and nothing was too spicy. FOR GROWN-UPS…The breakfast menu has plenty of classics (like crispy breakfast potatoes, bacon, and eggs), and some brilliant extras like brûléed grapefruit with caramelized sugar and fresh berries on top, and an epic breakfast burrito with chorizo, potatoes, and all the fixings. Place eggs, bacon, cheese and romaine in the tortillas. Serve beans, sour cream and pico de gallo on the side. While the grounds are amazing, and the restaurants are packed with delicious options, I didn’t want to miss telling you about our other favorite. 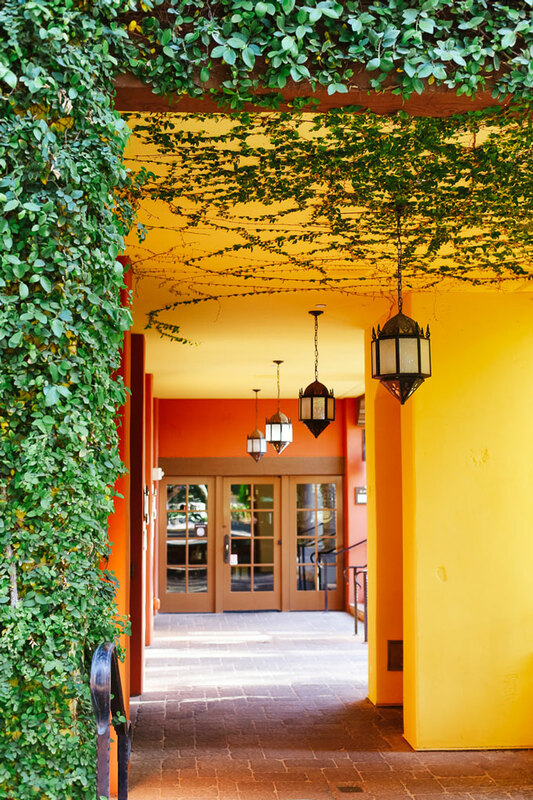 Tucked into a cozy corner of the hotel is Crave Cafe–it’s packed with gourmet chocolates and gifts, has an extensive coffee bar & smoothie menu, and carries several grab-and-go options that are great if you want to bring something with you while you’re out for the day. Our FAVORITE part of Crave was the gelato and sorbet selections. 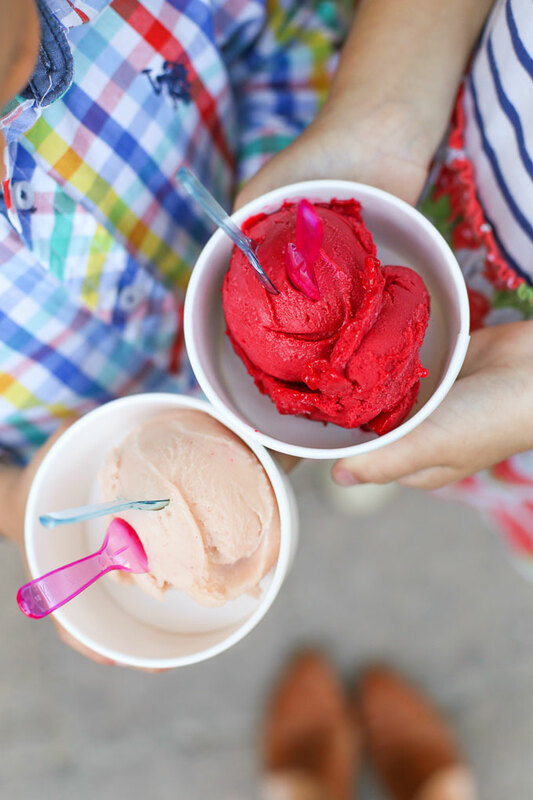 We had several flavors of sorbet (gluten & dairy free) to choose from. We went for raspberry and peach and both were phenomenal. If you can only choose one, we recommend raspberry. Plus, there’s a cozy fireplace seating area right outside that you can cozy up to if the ice cream makes you cold. It’s not to be missed! Thank you to Omni Hotels & Resorts for hosting us and for a chance to try your DELICIOUS new menu! 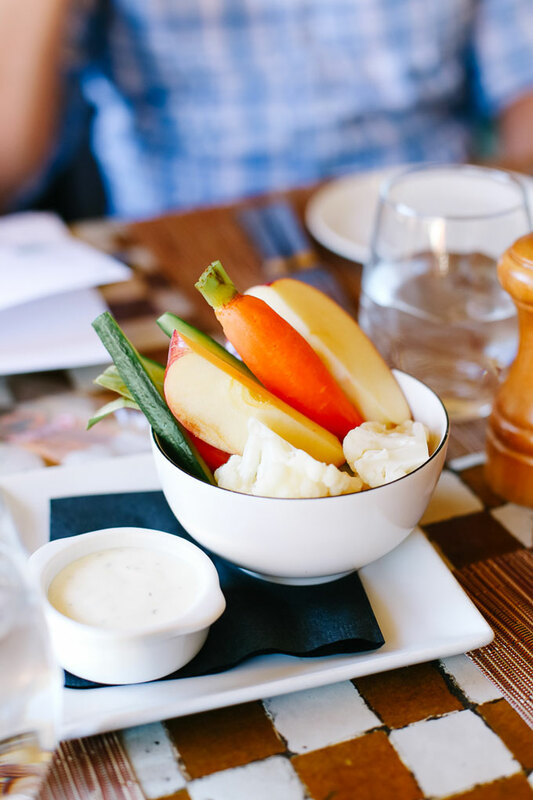 Find an Omni Hotel or Resort near you here and have fun exploring the dining options and menu picks at your hotel! « Classic Egg Salad + 3 Delicious Variations!